Growing up, we didn't eat fettuccine alfredo at home. It's one of my favorite dishes and we would always get it out at restaurants, but we didn't make it at home. 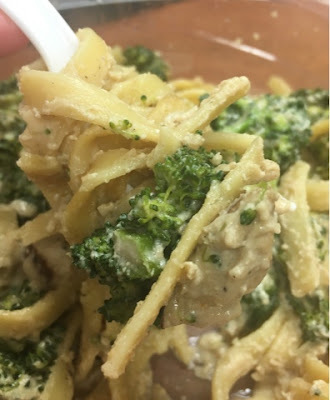 When I started doing my own cooking, I would try and make it with jarred alfredo sauce and it never tasted right! 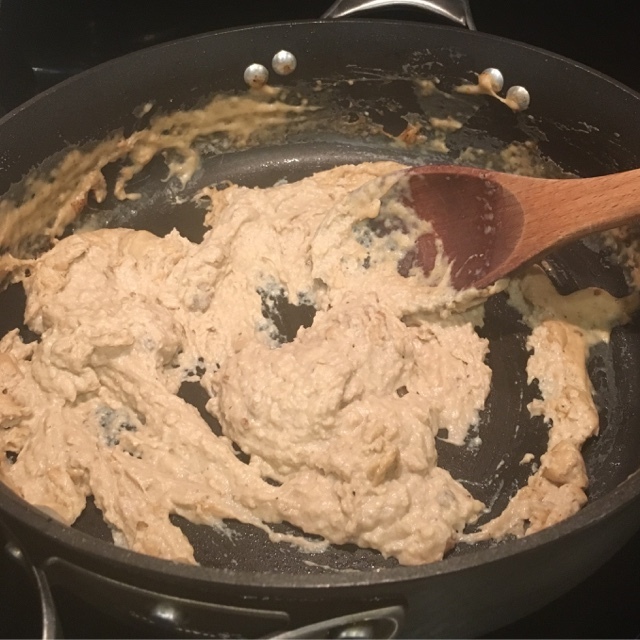 It wasn't until I learned how to make a roux and how to make pan gravy that I finally learned how to make fettuccine alfredo at home. And now, I'm going to share with you how I make it! Because this is what the leftovers look like! You're going to need two pots and a pan for this recipe. I don't know how to make it using less pots and pans than that. 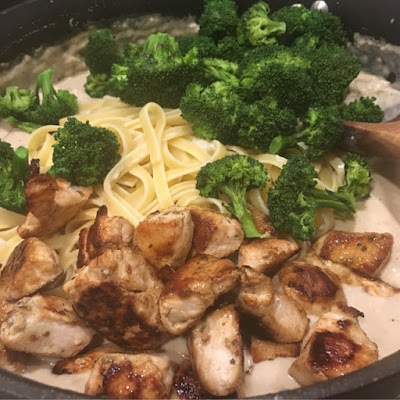 One pot for the pasta (I like to use my 3.5 quart Analon straining pot so I don't have to use a colander), one smaller pot for the broccoli (I use my 2 quart Calphalon Unison pot) and a large pan for the sauce and chicken (I use my 4 qt Calphalon Unison Saute Pan). You'll also need a slotted spoon, a spatula, and a whisk or wooden spoon for the sauce. I promise it is worth all these dishes! Start by dicing the chicken. I use whatever chicken or meat is in the house. 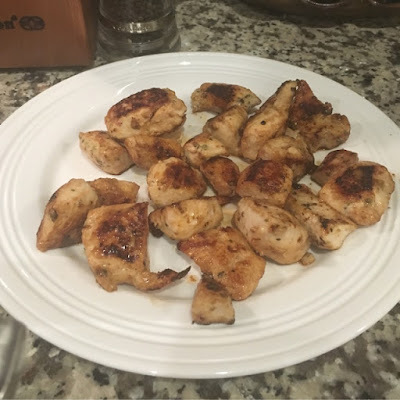 This time, I used two Italian seasoned Perdue Perfect Portion chicken breasts. Regular chicken breasts, chicken thighs, and shrimp are also great in this. Melt a tablespoon of butter in your saute pan and then dump the chicken in and heat at medium-high heat. I like to let them lay in the butter and not move them around so they get an awesome brown crust. After about two to three minutes, flip them to the other side. After two minutes on that side, stir them around in the pan to make sure all sides are browned and chicken is cooked through. Remove to a plate, cover and set aside. At this point, start boiling the water for your pasta. I waited too long to do that and then my sauce was ready way before my pasta. So start the boiling now! I used fettuccine, but really any pasta works. This is one of my favorite clean out your pantry/freezer recipes, in case you couldn't tell. Just use what you have! 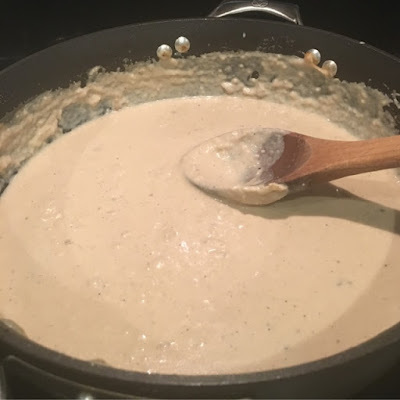 To make the roux, in the same pan that you browned the chicken in, melt two tablespoons of butter. When the butter is melted (make sure not to burn it), sprinkle three teaspoons of flour on top. Now, if you're me, you will eyeball all of this. I hardly measure any of this anymore. Stir the flour and butter mixture to make a paste that easily leaves the pan when you stir it. If it's not making a paste, add more flour. If it's too much of a paste (like straight up flour), add some more butter. It's all about fat versus flour. Since you browned the meat in butter, your sauce isn't going to be a creamy, white sauce. It's probably going to be a little brown. But for flavor wise, I prefer that. If you want a clean, white sauce, use a different pan for the meat. But you'll miss all the amazing flavor! Anyways, once the flour butter paste is made, add in the milk and half and half mixture. Stir around with a wooden spoon. Keep stirring until it starts to thicken, about three minutes. Add in the parmesan cheese and stir some more. Remove from heat and set aside or move to a keep warm eye on the stove, if you have one. This is the consistency I like my sauce to be with the parmesan added. At this point, start boiling the water for the broccoli. You want it at a full rolling boil. You're going to blanch the broccoli. I used to cook the broccoli with the chicken, but then it got soggy in the sauce. Blanching is a technique where you flash cook a fruit or vegetable, preserving it's color and texture. I do this a lot in canning, so it made sense to try it in this recipe and it works! To blanch the broccoli, put about half the broccoli in the pot (or all if you're using a larger pot). Cook for one minute once it starts to boil again. At the end of the minute, pull the pieces out with a slotted spoon. Repeat with the remaining broccoli. 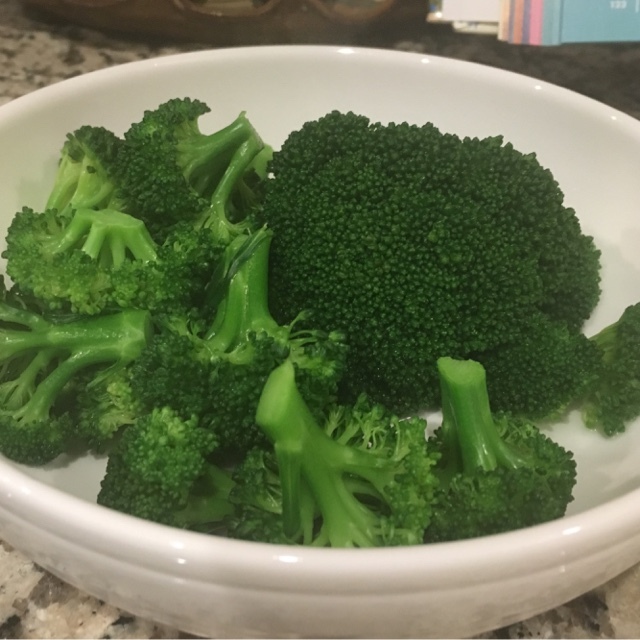 Set the broccoli aside in a separate dish and cover until ready to add. Finish up the pasta. Blanched broccoli. Look how green it is! 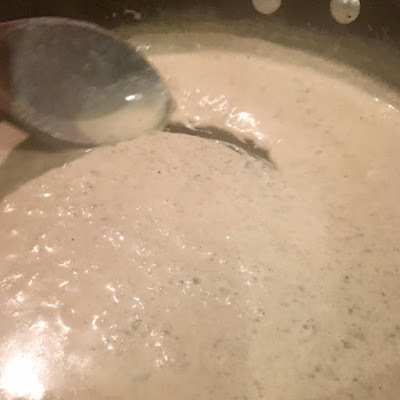 At this point, if your alfredo sauce looks like a nasty paste like this, no worries. This is what happens when you make your sauce before you boil the pasta, haha. There's this magical thing called pasta water. Once the pasta is done, add about 3/4 cup or a ladle spoon of pasta water to the sauce. Stir it around to mix in. You should now have a nice, creamy sauce that isn't too thick or too runny. Drain the pasta. Add in the broccoli and chicken and serve. Your sauce will stick to the noodles. Your chicken will be brown, beautiful and flavorful. And your broccoli will be bright green with the right crispness. It's a masterpiece and worth every stinkin' piece of dish you have to wash.
To reheat, because we live off of leftovers in this house, cook in the microwave at 70% power for 3 minutes. The sauce will have separated some, but not too much, and the broccoli will still be crisp (that's why you blanch!). The recipe without all my rambling is below. Also, fun fact, once you get a roux down, you're 80% of the way to making pan sausage gravy, which is the holy grail of food to cook in my book. 1. Melt 1 tbsp of butter. Brown the chicken. Remove from pan and set aside. 2. Prepare the pasta using directions on the box. 3. Melt 2 tbsp of butter. Sprinkle 3 tsp of flour over the butter and mix with a wooden spoon into a paste. 4. 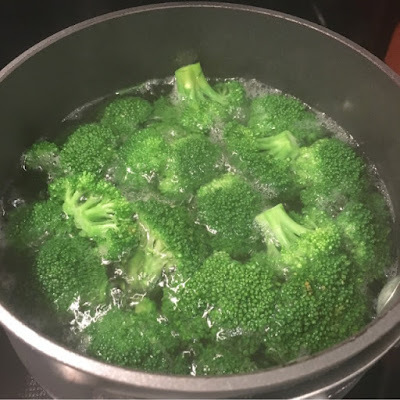 Start boiling water to blanch the broccoli. Once the water is at a rolling boil, add in half the broccoli. Once the water begins to boil again, boil for one minute and remove. Continue with the rest of the broccoli. 5. Add in the milk and half and half. Stir until thickened, about three minutes. 6. Add in the parmesan cheese and stir. 7. Add in the browned chicken and broccoli. Stir and serve! This looks so good! 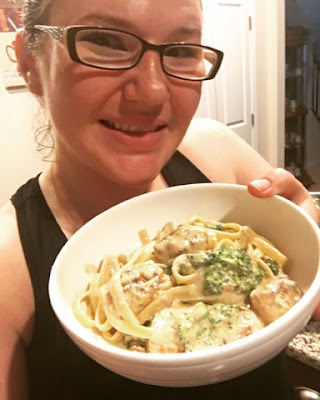 I just made alfredo sauce for the first time this week and it was so tasty! I need to add broccoli next time! That broccoli shines in this recipe and now I want some. Thanks for sharing.